Army training, private development, and federally protected species are competing for a limited, non-renewable resource: land. Military and private lands often contain valuable habitat for protected species. As rapid development occurs on private lands, habitat is fragmented and degraded, leaving the military increasing responsibilities to limit training, testing and operations to avoid species decline and ultimately provide for recovery. Species management on military lands often results in adverse impacts to assigned missions (i.e. encroachment) as the timing, type and location of training is adjusted to protect and conserve habitat. Recognizing the need to engage private landowners in the regional protection and conservation of red-cockaded woodpecker (RCW), the Army initiated a unique partnership with The Nature Conservancy in North Carolina, the Private Lands Initiative (RCI), either to purchase the outright fee to key parcels of RCW habitat or to work with landowners for the sale of conservation easements. Fort Bragg is home to many tenant organizations, but the most significant units it trains are the 82nd Airborne Division, XVIIIth Airborne Corps and U.S. Army Special Operations Command. Fort Bragg is the "Home of the Airborne," and its units are expected to rapidly deploy anywhere in the world and to fight and win upon arrival. The installation is the Army's most important power projection platform, is in constant use for soldier training, and requires constant use of its 140,000 acres of training lands. At the same time, it provides the largest block of contiguous long-leaf pine and wiregrass habitat for conservation of the red-cockaded woodpecker in the Sandhills East Recovery Unit for the RCW. In the 1990s the competition between military training and RCW management on Fort Bragg lead to serious conflicts between Fort Bragg and the U.S Fish and Wildlife Service (usfws) with the shutdown of important training ranges and the prospect of increased training limitations. The outcome was a major shift in thinking: Both the Army and the usfws agreed to take serious steps to engage off-post landowners in the perpetual conservation of RCW habitat with the dual goals of restoring habitat across the recovery unit while easing Fort Bragg's burden. Known initially as the Private Lands Initiative (PLI), Fort Bragg turned to an unlikely partner to achieve these objectives  The Nature Conservancy (TNC), an organization with the primary purpose of protecting and restoring critical natural systems. In 1995, the Army entered into a cooperative agreement with TNC, calling for TNC to purchase and protect in perpetuity fee interests or conservation easements in lands from willing landowners. The Army and TNC agreed to share resources in this endeavor. In addition to permanently protecting RCW habitat, the purchase or encumbrance of tracts along the installation border preclude incompatible land uses (sprawl) while furthering RCW recovery. Technical support and oversight to this protection initiative is provided by the North Carolina Sandhills Conservation Partnership, which includes Fort Bragg, the State of North Carolina, The Nature Conservancy, the U.S. Fish and Wildlife Service, Sandhills Ecological Institute, Sandhills Area Land Trust, and others. 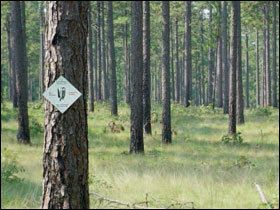 As of April 2007, 24 tracts of land totaling 12,254 acres have been acquired or protected. The Army's cost was about $8 million, with partners contributing about $23 million. On June 7, 2006, the Department of the Interior, the U.S. Fish and Wildlife Service, and the U.S. Army partnered to celebrate and commemorate the recovery milestone of the RCW population in the Sandhills East Recovery unit, a primary core recovery population, five years earlier than anticipated. Further, the Army and usfws recently revised management guidelines for RCW on Army installations, virtually eliminating restrictions on training at Fort Bragg. Though a highly professional on-post conservation program was the foundation, PLI played a significant role in these successes. The Department of Defense (DoD) recognized the power of this approach to address encroachment by conserving habitat and reducing the effects of burgeoning urban and suburban sprawl. Using the Fort Bragg approach as a model, DoD worked with Congress to clarify and expand legislative authority. Congress (through the National Defense Authorization Act for Fiscal Year 2003 , Section 2811) enacted “Agreements to Limit Encroachment and Other Constraints on Military Training," now codified at 10 u.s.c. Section 2684Aa. The Army implemented this authority, formalizing the Army Compatible Use Buffer (ACUB) Program. In 2005, the Department of Defense established the Readiness and Environmental Protection Initiative (REPI) which endeavors to fund buffer protection programs throughout the Department of Defense modeled largely on the Army's ACUB program. Due to the Army's success with PLI at Fort Bragg and establishment of the ACUB program, many other Army installations across the United States (e.g. Ft. Huachuca, Arizona; Ft. Carson, Colorado; Ft. Stewart, Georgia; Camp Blanding, Florida, and others) quickly developed similar cooperative conservation partnerships. The other military services have followed suit on lands under their jurisdiction. Through the repi, the DoD funded the ACUB program for the first time in fy05, granting $6.5 million to the Army. The Army supplemented the sum with an additional $12.9 million. Those funds were obligated towards cooperative agreements at Fort Bragg; Camp Blanding, Florida; Camp Ripley, Minnesota; Fort Carson, Colorado; Fort Stewart, Georgia; and the U.S. Army Garrison Hawai‘i. As of 30 September 2006, ACUB has protected in perpetuity a total of 53 parcels covering approximately 63,370 acres in 15 states. Additionally, the value of partnership contributions is estimated at $91million. The number of Army installations with approved ACUB projects was set to expand from 16 to 21 by 1 October 2007. The conservation benefit of this initiative is that large tracts of land with critical natural systems are being protected and managed forever. These are especially valuable in that most are adjacent to large core natural areas (e.g. impact areas, maneuver lands, etc.) and are therefore more stable platforms for biodiversity conservation than isolated tracts of comparable size owing to the exclusion of people and other potential disturbance factors. The ACUB program has allowed Army installations to move from singular focus on large blocks of isolated habitat on-post to working across the landscape on an ecosystem level, thus achieving long-term conservation goals. The development of the pilot project and the expansion of off-post conservation efforts required a fundamental change in the Army's culture. Many senior military staff vigorously opposed expending human and financial resources on natural resources conservation on non-Army lands. Responsibility for management of resources historically ended at the “fenceline." In addition, many officials held deep seeded suspicions of the conservation community, based upon regulatory action under the Endangered Species Act to shut down Army ranges and threaten criminal enforcement. Similarly, many environmental organizations were suspicious of the Army's commitment to environmental conservation due to previous high profile environmental controversies involving historic environmental contamination that called into question the Army's stewardship ethic. Moreover private landowners, key to the success of the PLI, ACUB and repi programs held deeprooted concerns, based on the vast expansion of military lands to support WWI and WWII, that the military was engaging in yet another private property land grab. And local governments in rural and economically depressed areas had serious concerns for the loss of tax revenues. The building of trust between these four communities has taken over 12 years at Fort Bragg. Success in using cooperative conservation partnerships to limit encroachment, conserve natural habitat, and engage necessary participants is essentially a function of establishing trust and enduring relationships with diverse organizations that are willing to devote and leverage resources. Such partnerships are capable of achieving landscape goals that would be unattainable by individual participants. Cooperative conservation to achieve consensus on a common path forward is often a long-term and expensive process (in terms of human and financial resources) of inter-organizational bioregional conservation planning, landowner education and public outreach. The plan must be based upon comprehensive inventories, perpetual monitoring, and application of the principles of conservation biology. While such planning is critical, true success can only be achieved when cooperative agreements result in the acquisition of interests in real property necessary to restrict incompatible development and provide for the perpetual protection and conservation of habitat. Most importantly, both the Army and the conservation community have recognized that while their primary missions may differ, they share a common goal of limiting or avoiding the unrestricted development of lands ecologically related to the valuable natural habitat occurring on Army lands. The potential to serve multiple public purposes (e.g. endangered species recovery, ecosystem conservation, reduced sprawl, increased soldier training, and outdoor recreation) must be served by protection of the same tracts of land. Military trainers and the conservation community are natural allies. Sensitive species and the natural habitat upon which they rely are often the Army's best neighbors.